The impact of drones in multiple industry sectors, including insurance, has been the subject of increasing interest. Market research is making a forceful case that drones are a technology that insurers cannot afford to ignore–drone uptake globally and their growing capabilities present multiple opportunities for insurers. A recent Goldman Sachs report forecast that drones will create a $100 billion global market opportunity by 2020. The fastest growth, the report predicts, will come in commercial and civil government uses of drones. The banking group expects governments and businesses to spend $13 billion on drones between now and 2020 and consumers to spend $17 billion. This will create a $1.4 billion market for drone insurance, the report predicts. PwC is even more bullish. A report released in May calculates the global market for the commercial application of drones at over $127 billion, and predicts that drones will generate $6.8 billion in value for the insurance industry. A CB Insights report released in July adds more context to this picture of an emerging industry. Private drone firms, the report claims, have raised $1.6 billion in equity funding since 2012 in more than 300 deals. That accounts for about a fifth of all Industrial Internet of things (IIoT) investment, making drones the second-biggest field of IIoT investment. 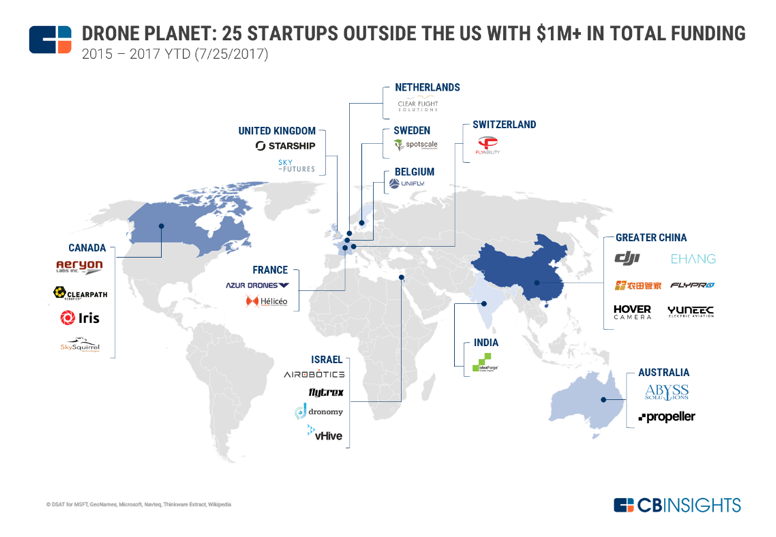 The CB Insights Report includes a graphic that illustrates the geographic diversity of the drone industry. The growing value of the global drone industry and the growing capabilities of individual drones both present important opportunities to insurers. The provision of drone insurance will become a growing business as these machines are used in greater and greater numbers. This will give insurers the chance to grow their core business. Drones themselves can be useful tools for improving insurance operations. They will give insurers the opportunity to innovate. The use of drones across industry segments will impact risk, and how it is insured. In my next three posts in this series, I look at the use of drones in insurance applications, the imperative for drones to be insured, and the potential impact of cyber threats.